You will also be interested in our page highlighting picture books about caring for our environment, the water cycle, reducing our environmental footprint and more. Terrific resources for Earth Day and Arbor Day. Marvelous Plasticine illustrations may initially distract young readers from the thought-provoking text in Picture a Tree. 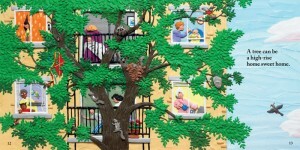 Using a combination of Plasticine and paint, Ms. Reid has created beautiful, richly detailed images of trees and the variety of people living, working and playing near them. Readers are encouraged to notice how trees, whether enormous or freshly planted, change through the year, how various creatures dwell in trees and how the life cycle of a tree can be viewed metaphorically. A variety of perspectives are also shown as Ms. Reid illustrates shadows of trees, more than one reflection and the view from above a forest of trees. You may see a drawing on the sky. A game of dress-up. The first drops of colour then all the art supplies at once. Simply beautiful, Picture a Tree is sure to inspire young artists and encourage environmental awareness. It is suitable for children aged four and up. Note, this is one of several YouTube videos that feature Barbara Reid and her artwork. Check her website or YouTube for additional resources. 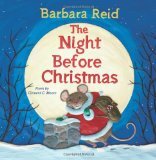 Barbara Reid is an award winning author/illustrator who is well known for her amazing Plasticine illustrations. In 2004 she received the Ruth and Sylvia Schwartz award for The Subway Mouse. This is an endearing tale of love and adventure. Nib is a young mouse who lives in a busy subway station. At nighttime, when the station is quiet, Nib loves to listen to stories about Tunnel’s End. “Tunnel’s End was also beautiful. The air was sweet. A brave mouse could find the tastiest foods, the softest nests.” One day, after having his nest destroyed by his cousins and tired of living in the noise and dust of the station, Nib sets off on the adventure of a lifetime. Before long, he meets Lola and soon the two friends are on a quest for fresh air, clear skies and freedom. The journey to Tunnel’s End is not without danger; gangs of mice resent the young intruders and there is a considerable distance to travel. Breath-taking Plasticine illustrations include many found objects and make this a book that is sure to inspire young artists. 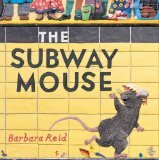 Highly recommended for young readers aged four to nine years – especially those who will be riding on a subway train sometime soon. Our free “Building a Snowman” printable for kids has been enormously popular this month so I thought I would pull together some more snow-related materials that would be great for a preschool or kindergarten snow theme. I have added more Snow and Snowmen materials today. I would love to hear about your favourite resources and suggestions. This sturdy, fun board book caught my eye and will have great appeal for toddlers. The illustrations and text are simple and yet very engaging. I especially liked the description of “snow crunching under boots” and a matching slippery, noisy surface that begs to be touched. Very young children will thoroughly enjoy checking out a variety of textures as they learn about the season of swirling snowflakes, cold temperatures and wind. All You Need for a Snowman is a book that I have used with 4, 5 and 6 year olds many times. Bright, energetic illustrations and lyrical rhyming text tells the story of a group of children who build two enormous snowmen. This is a book that preschoolers gravitate towards – they enjoy watching the process of building a snowman and celebrate the end product, a giant, happy snowman. 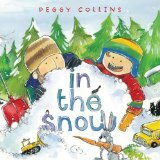 In the Snow tells the story of a young boy who is excited when he awakens to snow. Eager to have fun, he dresses in warm clothes goes outside with his father. They fill the bird feeder and notice some animal tracks in the fresh snow. The father and son have a happy, playful relationship and soon get to work and build a huge snowman. Also vividly illustrated, In the Snow will be enjoyed best by preschoolers. Note: the brief mention of animal prints in the snow as well as the action of filling a birdfeeder, provide opportunities for a discussion about urban wildlife and further extension activities. 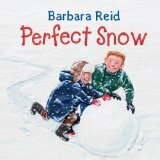 Snow theme picture book published by Harcourt, Inc.
What could be more wonderful for a young child than waking up to freshly fallen snow? Ms Rylant’s evocative writing and Ms Stringer’s lovely paintings beautifully capture the wonder and delight of a snowy day in Snow. An exuberant young girl shares the special day with a friend and her grandmother. This beautiful book will surely leave you wishing for a magical snowy day to share with your youngster. When an overnight snowfall grounds flights and forces the cancellation of kindergarten, a young rabbit spends a quiet day at home in The Snow Day. Mommy and her child play cards together and enjoy a day together at home. Late in the evening, when the snowfall stops, the two go outside for some quiet play in the cold, snowy darkness. Gentle, evocative illustrations beautifully depict the peace of a snowy day. A great choice for kindergarten. When Baby Bear’s soup is too hot and burns his mouth, he and his snow bear family leave their igloo and go for a stroll. Meanwhile, Aloo-ki is searching for her sled dogs. She happens upon the bear family’s igloo and is soon inside, tasting soup, trying on boots and sleeping in Baby Bear’s “just right” bed. Beautifully illustrated, this is a truly inspired adaption of Goldilocks’ story. Terrific for newly independent readers, the Houndsley and Catina books are also a very good choice for children who are ready to enjoy a longer read-aloud book. 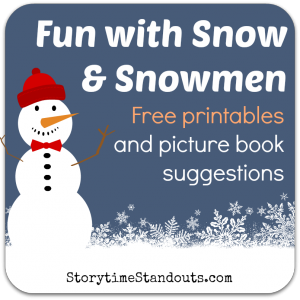 Step 3 – Choose from any of our 250 free downloads, including these free Snow and Snowman theme printables. 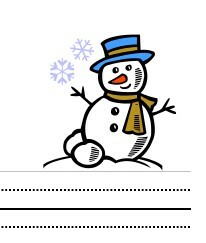 Snow theme interlined paper for beginning writers. Free printable Winter picture dictionary for readers and writers in kindergarten and grade one. Follow Storytime Standouts’s board Snow, Snowmen and Ice for Preschool and Kindergarten on Pinterest. Discover the benefits of sharing nursery rhymes with children and take advantage of our free printable nursery rhymes. A substantial part of my work is with young children. 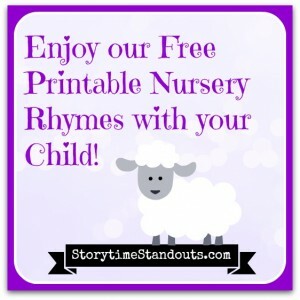 I have found printable nursery rhymes very beneficial. If they have enjoyed wordplay and stories at home, children are often somewhat familiar with the rhymes, they enjoy the rhyming and repetition and they welcome the opportunity to create a “book” of nursery rhmyes and “read” text. “Reading” along while repeating a familiar rhyme, is an opportunity to practice directional tracking by sliding a finger along the familiar words (from left to right, top to bottom). For children who are new to English, learning nursery rhymes also introduces characters that they will encounter again and again and the rhythm of English. Nursery rhymes introduce many literary devices: repetition (Twinkle, Twinkle, Little Star; Polly, Put the Kettle On), onomatopoeia (Baa Baa Black sheep; This Little Pig; Old King Cole; Ding, Dong, Bell), alliteration (Little Boy Blue; Sing a Song O’Sixpence; Goosie, Goosie, Gander; Peter, Peter, Pumpkin Eater; Wee Willie Winkie) and imagery (Humpty Dumpty, Little Miss Muffet). 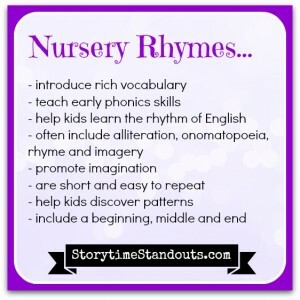 Nursery rhymes also introduce rich vocabulary. 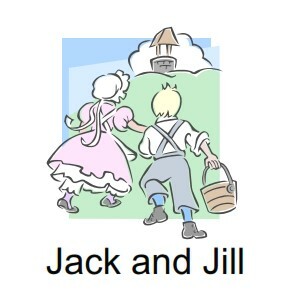 Jack and Jill introduces fetch, pail, crown and tumbling. These are probably not words that are used in everyday conversation so, just by sharing and talking about nursery rhymes, a child’s vocabulary is expanded. Prior to creating my own printable nursery rhymes, I often visited Webbing Into Literacy and used A Rhyme a Week. The Storytime Standouts printable nursery rhymes can used to create a nursery rhyme booklet and/or as learning activities. You will find our selection of free printable alphabets here, rhymes, songs, fingerplays and chants here and all of our early learning printables for children here. Step 2 – Pin this page, share this page or “Like” us on Facebook. Step 3 – Choose from any of our 250 free downloads, including these free printable nursery rhymes. Traditional English nursery rhyme that includes repetition, rhyming and imagery. Traditional English-language nursery rhyme. Usually includes an anthropomorphic (possessing human traits, emotions) egg. Traditional English-language nursery rhyme. Includes alliteration and rhyming. Traditional English-language nursery rhyme featuring alliteration and rhyming. If you are interested in nursery rhyme books, I can personally recommend Barbara Reid’s Sing a Song of Mother Goose. Ms. Reid is renowned for her marvelous plasticine artwork. Sing a Song of Mother Goose features beautiful, bold illustrations of fourteen well-known nursery rhymes. A lovely gift for a new baby, it is available as a board book, paperback and in a hardcover gift edition.